The V30 is physically small, weighing only about 440 lb. fully fuelled up. With a claimed 62 hp on tap, it makes for great performance. 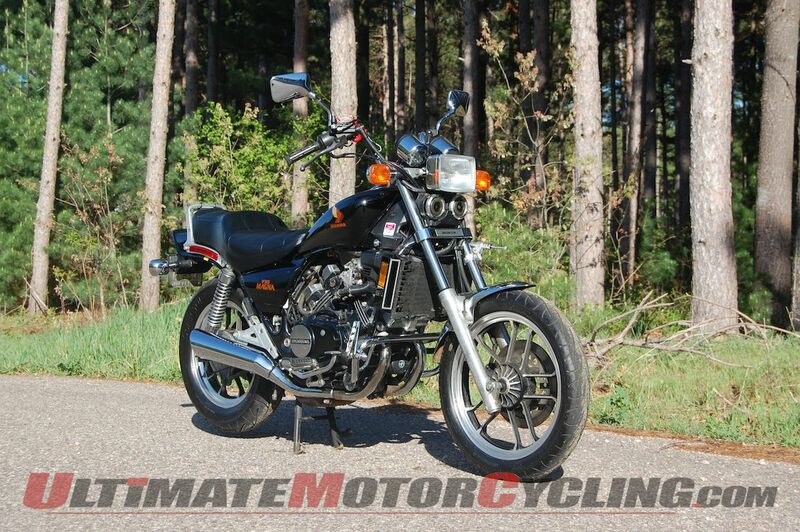 In 1984 Honda’s VF500C V30 Magna raised the bar on 500cc performance, so how’s it doing 30 years later? When Honda introduced the first of its new VF series of liquid-cooled 750cc V4 motorcycles in 1982, the earth moved under the feet of every other motorcycle manufacturer who had poured development money into their next generations of air-cooled in-line DOHC fours. Honda’s new V4 motors allowed a narrower engine package, very minimal vibration, a whole new level of performance, and expectations of very long engine life thanks to liquid cooling. By 1984, Honda expanded the range up to the 1100 cc powerhouse V65 Magna and Sabre, and down to the VF700C Magna, 500 cc V30 Magna and Interceptor. The VF500C V30 Magna lasted only two model years, and was not produced in large numbers. This makes it something of a rarity these days. I happened upon one when the seller’s garage had to be cleaned out and the Magna, which had sat untouched under a tarp for 13 years had to go. Overall appearance was like new, but beneath the surface there were some problems. The fuel left in the main tank and sub-tank—yes, the V30 Magna has two gas tanks—had soured to a black slurry. There was little doubt that the four carburetors that nest criss-crossed between the banks of cylinders, the electric fuel pump, fuel filter and gas lines were going to be a mess. The hydraulic fluid in both the clutch and front brake had gelled to a yellowish putty state resembling honey mixed with loads of sugar crystals. A dead battery and plenty of corrosion on many connections made the electrical system something of a nightmare. Other miscellaneous areas of corrosion on chassis, chain and elsewhere showed the ravages of long neglect. Dry-rot had gotten to the tires. Even the air filter suggested some scary problems, with a large hole of uncertain origin eaten right through its paper element. Forewarned by the seller of potentially high costs for restoration, the asking price was only $400, which included a trailer. Knowing little about the Honda V-4 powered bikes in general and even less about what it might take to get this one back on the road, I paid the man and took it home anyway. With other bikes available to ride, the restoration was a low-pressure, one step at a time project. Cleaning up the fuel system, a new battery, cleaning up the electrics and testing the fuel pump came first. Then cleaning, refilling and bleeding the hydraulic clutch and front disc brake. Since being restored from non-running status, the author’s V30 has been run on the Bonneville Salt Flats in Motorcycle Speed Trial competition at two speed trial events. Fortunately, none of that hardware had to be replaced; even the brake calipers broke loose and worked without being rebuilt. Next, new tires, O-ring chain and sprockets were fitted. I found that most parts for the Magna would still be generally available, though I didn’t end up needing much. After several months of on-and-off tinkering, and some initial hesitancy to fire on all four cylinders, the Magna backfired through the exhaust and suddenly roared to life. A twist of the throttle sent the tach needle soaring toward the bike’s 11,500 RPM redline. After gearing up and taking about 10 miles on back roads at an easy pace, I took the Magna to a stretch of pavement near the local airport with no cross roads, no other traffic and no roadside view obstructions. The little Magna pulled like a tractor when engine speed was kept above 8000 rpm and gained speed at a pace more akin to something 750cc in displacement or even larger. What made the magic happen? The V4 power package had an extensive racing pedigree that carried many of the key design features over from racing to the street versions, for example, double overhead cams, four valves per cylinder, liquid cooling and a six speed transmission. Unlike the larger displacement V4s of the day, the VF500 models had O-ring chain final drive instead of shaft drive. An 11.0:1 compression ratio and 90° V cylinder configuration for good primary balance helped maximize power and minimize vibration without the added weight of a counterbalancer. Even without adjusting the carburation for high altitude, the rejuvenated V30 reached over 104 mph at Bonneville. How did it work? Cycle magazine testers achieved an E.T. of 12.79 sec. at 103.03 mph in the standing start quarter mile! Acceleration from 0 to 60 mph was clocked at 3.9 seconds—both results better than many 750s of the day. Calculated top speed at the red line in 6th gear is 140 mph. Despite these imposing performance numbers, the testers also achieved an average fuel economy of 45.3 miles per gallon on the road. So, you may ask, how does the little Honda superbike do in real life, about 30 years later? In 2009, when I took the Magna to the SCTA World Finals at the Bonneville Salt Flats, it achieved a best run of 104.536 mph, which was done without re-jetting or leaning out the carburetors to compensate for the high altitude at the salt flats. That speed was only about 7.5 mph off the 500 cc production class record on the books at the time. In terms of fuel economy, I routinely get between 42 and 44 mpg with the old V30. And, after all these years, what about reliability? Except for routine maintenance, oil changes, and so on, the only thing that has had to be replaced is the tail light bulb! Oddly enough, that turned out to be quite a project, but that’s a story for another day.